Phillies fans line up to enter a walk-through metal detector at Citizens Bank Park. 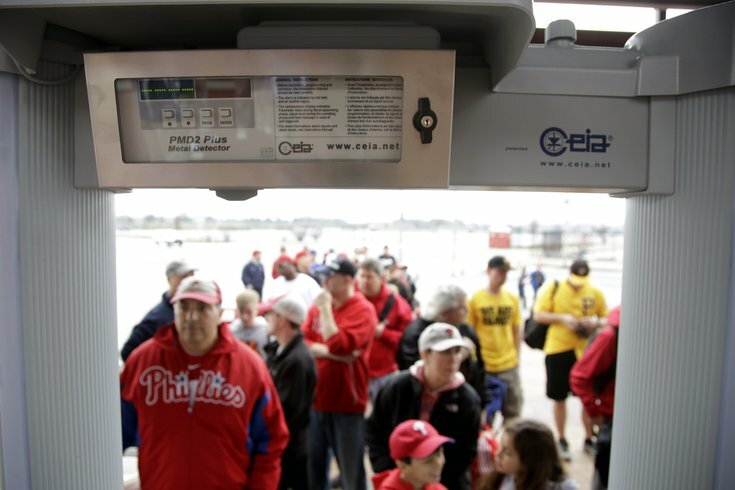 The Phillies are the latest team to implement the use of metal detectors for fans who want to get into the stadium. The chaos of Opening Day was predictable as fans had long lines and wait times to get into the ballpark. It was a full stadium and a beautiful day, which probably meant most people were in a better frame of mind and at least understanding as they waited in line. That level of patience will not last long. And it shouldn’t. With the amount of money pocketed by the Phillies, Eagles, Flyers and Sixers, there is no reason a quicker method can’t be implemented. Given the skyrocketing cost of tickets to any of these games, and the cost of parking and food, you would think it was mandatory that the teams make it as easy as possible to get into the facility. It doesn’t matter if it’s Citizens Bank Park, the Linc or the Wells Fargo Center, the fans deserve easy access into the building. There is no way that the size of a crowd should be an excuse. The teams know how many seats they have sold – and they really ought to know how many seats are in the building. From there, you figure out how many metal detectors you need, and how quickly you have to get people into the building. This is not the Philadelphia airport where people have suitcases as carry-on items and overnight bags. Eventually all teams are going to be required to have such safety measures – and here is an idea that might make it easier for everybody. And the real twist is that is might also make more money for the teams, which is why it has some merit. Why not have special passes for season ticket holders and others – just as the airlines do. This is a simple solution with little downside for anybody. If you are a fan of the team, make it possible to sign up for a fingerprint process. To make it very simple, call it a four-for-four application that allows access to all the venues without the wait. It might be too much to ask that season ticket holders get that access for free, but you would think that most fans would pay the access fee. This would basically amount to an Easy Pass, and although you might argue it’s just another cost to attending a game, at least it would alleviate the wait, and would ultimately make everybody safer. The fact that it would make the teams even richer … well, that’s the bottom line for everything. The Phillies season is not even two games old and we can already be assured of who will be the team’s MVP when it’s all over. It won’t be Chase Utley. It won’t be Ryan Howard. And it’s more likely Cole Hamels will be the MVP of the Red Sox than the Phillies. No matter how bad things get, no matter what the club’s record, no matter who’s batting where in the order, the Phanatic will put on a show. At some point, no matter what the score, the Phanatic will put a smile on your face. It won’t show up in the statistics, but it will show up in terms of how the public feels about the team. No matter how bad things get, there will always be some good vibrations about the team, and that is due to the man in green. Even Chip Kelly has to take a back seat to the Phanatic. The MVP of the Phillies, and MVP to all sports fans in the city. The Masters is set to launch, and Augusta National has once again become a TV stage for Tiger Woods. Through all his personal and professional problems, Woods remains THE face of golf. It has been years since Woods was a force in the sport, and he has now dropped out of the sport’s top 100, but nobody draws an audience and sells product like Woods. Woods has reached that pinnacle where he is bigger than the game, and he is still at that point where people still think he can come back and win a major. Despite nagging back injuries, wild changes in his swing, changes in swing coaches and a horrendous short game, people think Woods can make a magical comeback. Due to the nature of the sport, and due to Woods’ early success, there is every possibility that he will remain as a face of the game through the decade and beyond. Due to his transgressions, he will never occupy a spot equal to Arnie and Jack, but he has carved out a huge spot in American sports history. For the sake of the sport, here’s hoping he uses this weekend as a platform to get back in the game. The Flyers’ season will come to a close this weekend, and it would certainly be no surprise if it is also the end of Craig Berube’s tenure as the club’s head coach, especially with so many good coaching candidates who will be available. The opinion here is that Berube has gotten a whole lot out of a team that lacked a solid defense all season. However, the option would be to come back next season with all eyes on Berube as the first coach expected to be fired, and that rarely works. There is also a suspicion that general manager Ron Hextall wants to make wholesale changes that go well beyond the head coach and he will use a wide broom that sweeps clean.